This entry was posted on June 20, 2015 at 10:00 pm and is filed under Animation, Comedy, Drama, Family. You can follow any responses to this entry through the RSS 2.0 feed. You can leave a response, or trackback from your own site. When you reviewed the movie, you and most of the critics grade this movie so high based on your adult perspective. But I actually saw a lot of kids gering bored to dead with this movie, they didn’t get anything about it. So… could it be that, any adult review is simply not fair? because this is a kids movie? I enjoyed most of the parts but I really think, some kids won’t even care. I’ve seen it twice and kids in my theaters loved it. great review Mark. will be seeing this movie very soon. “Up” was a great movie with an imagination that reminded me of the Japanese animated films by Miyazaki. am hoping that Inside Out is able to generate a similar experience, per your review, it is about a navigation to a command center, so its kind of like a journey. am looking forward to this movie. It definitely compares favorably to Up. Ranks in the upper half of the Pixar canon. I love Pixar so I’ve enjoyed their entire oeuvre (except Brave) BUT if you just want the classics, skip everything after Toy Story 3 and watch this. Loved the film and Pixar are back to the quality we expect from them. Left the screening with a big smile on my face. At the moment this is my favorite movie of the year. Easily in my Top 10. Still 6 months to go, but I wouldn’t be surprised if it stays there. Love your review! And it is kind of an Incredible Journey within the mind of Riley. I’ve seen it twice now and it is so moving. I cry, cry, cry at that ending. I think in many ways it is very similar to Up but at different ends of the memory spectrum. It kind of reminded me of the play Our Town and the great Japanese film After Life which both deal with memories. But there is also tons of great laughs and dazzling visuals. The only part that may be tough for very small children is the clown is pretty scary. There was a little girl in one of my screenings that had to be taken out at that time. I also liked how in Imaginationland everything was changing. Childhood was being taken down and new things were being developed like Riley’s imaginary boyfriend. I’m really thrilled it did so well and think it will have strong legs like Frozen or even this years Cinderella. I love your response. I never saw After Life (1998) but now I want to. It’s fun when we see other films within the context of a new film. Yes, like Frozen, it should have long legs and play well through the entire summer. Thanks for commenting! Oh After Life is such a good movie. I think Roger Ebert had it as one of his masterpiece films. And on the surface you’ll think I’m nuts for comparing the two but there are similarities. I guess a movie about emotions and memory is going to relate to all kinds of movies. Oh another good one that deals with memories is Defending Your Life, the great Albert Brooks movie. Heard so many brilliant things about this. We don’t get it until July unfortunately. With Agents of SHIELD and now this, Kyle MacLachlan is really stepping up the fatherly roles these days! Great write-up Mark. Cool! I didn’t realize Kyle was on Agents of S.H.I.E.L.D. He occasionally guest stars as the mayor on the TV show Portlandia too. He’s really good! I’ve come across Portlandia on Netflix. Don’t know an awful lot about it, worth checking out? I haven’t watched enough to answer that personally but its received a fair share of critical acclaim. A stellar film. If I were in charge of your ratings, I’d boost this to 4.5 stars. It’s a deep, complex and unforgettable film. Oh, and it’s animated wonderfully. It’s got a good chance of making my favorites by year’s end. Great review man. I wouldn’t get too distracted with the number of stars. I enjoyed it immensely. The simplification of a complex idea was ideally presented for kids while dazzling adults as well. I thought this was very good and very creative, however, it didn’t blow me away. It is in my top 5 of all Pixar movies. Minor nitpick: parents had all male or female emotions, but the daughter had men and women. Her friends too. 4 stars. Is that a nitpick? I think maybe that said something about the ways their minds worked. Also…I’m confused. It didn’t blow you away, but it’s in your Top 5 of all Pixar movies? That’s high priase in my book! I agree that Pixar’s distillation of its idea with Inside Out is surprisingly lucid for a high concept that could be complicated and difficult to execute. I also agree that it’s a dazzling manifestation of the emotional mind, visually and aurally. Strangely I’ve never heard of Herman’s Head. Not sure how I missed that show. You’re right that it’s a return to form for Pixar and the narrative is pretty straightfoward, but as you say, there’s a beauty in simplifying a complicated subject. It all seems effortless, which is an impressive feat. 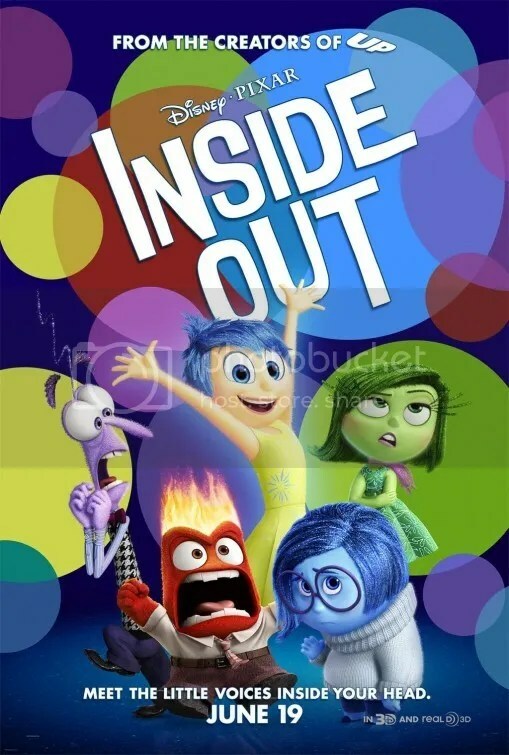 Inside Out is definitely high on the list of my favorite films from this year. One of those rare films that manages to be both a huge hit with the critics as well as the public.